Prominent & Leading Exporter from Ahmedabad, we offer aluminized boiler suit. We are among the pioneers in the industry for supplying and trading Aluminized Boiler Suit to a large clientele. This boiler suit is made in tune with the industry standards and has earned us loads of profits. It is resistant to strong chemicals including acids and alkalis, fire retardant and meant to serve for a longer period of time. This suit is comfortable and extensively demanded in chemical, pharmaceutical and oil industries. 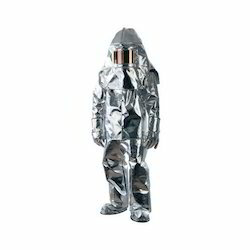 Looking for Aluminized Boiler Suit ?